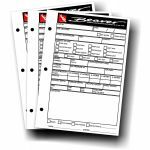 The Beaver Dive Folder is a great way to store all of your essential dive logs and notes. Crafted from strong cordula, the dive folder is strong and reliable, perfect for throwing in your bag without a worry. The three ring folder is perfect for storing any essential papers, maps, charts, or log books. The folder is A4 sized. Inside there is also a number of extra storage options. There is a velcro closure pouch perfect for keeping smaller items and a number of pouches for keeping smaller paper. On the other side there is a mesh netting for keeping items secure and a hook for attaching a pen or any other accessories. Durable - Crafted from strong cordula, the dive folder is strong and reliable, perfect for throwing in your bag without a worry. Useful - The three ring folder is perfect for storing any essential papers, maps, charts, or log books. Good Size - There is a velcro closure pouch perfect for keeping smaller items and a number of pouches for keeping smaller paper. On the other side there is a mesh netting for keeping items secure and a hook for attaching a pen or any other accessories. Who is the Beaver Dive Folder For? The Beaver Dive Folder is perfect for anyone looking for a great way to store their dive essentials. Log books, documents, charts, maps and papers can all be stored in this handily sized dive folder.